In this article we are going to learn how to build a Basic Apollo Express GraphQL API with TypeScript. I’ve been looking for a dead simple tutorial to get started and didn’t find any so I decided to write my first article on Medium with this topic! ⚠️Disclaimer: This is obviously not a production ready project, this is an illustration of a basic setup with TypeScript, don’t use it in production if you don’t know what you are doing. 🏎️ If you do not have the time to read this because there are 27 more articles waiting for you in your browser’s tabs, here is the full code. For those, like me, that weren’t used to build Node.js app with TypeScript, the first chapter is for you even though you should be already convinced if you are here. 🚀 Compilation: TypeScript compiles and generate compilation errors if it finds some sort of syntax errors. It helps to highlight errors before the script actually runs and fails. 🚀Strong Static Typing: TypeScript comes with an optional static typing and type inference system through the TLS (TypeScript Language Service). Also, it provides code analysis and auto-completion for IDEs. So you didn’t come here to learn why TypeScript is awesome, did you? Create a new folder for the project and create a package.json file with the help of the CLI. 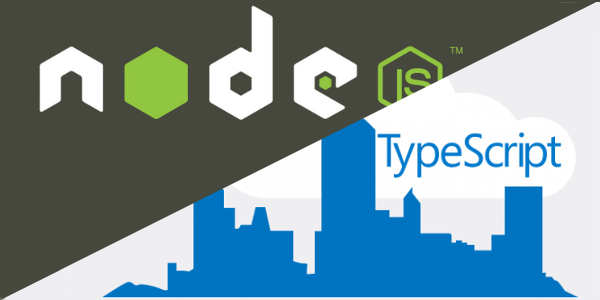 Install Typescript and generate a tsconfig.json file using npx. We will also need nodemon to compile our code on change, and ts-node to exec TypeScript files. Create a/src directory with a server.ts file. "build:dev": "nodemon 'src/server.ts' --exec 'ts-node' src/server.ts -e ts,graphql"
With that, you should be able to type npm run start:dev in your terminal to start nodemon and see our console.log. Nodemon should also recompile if you change the code in the server.ts file. If you are new to GraphQL, I won’t cover the concept here as it’s not the topic but here is a link introducing GraphQL. First, let’s create our GraphQL Schema. In the /src folder, create a /schema folder and 1file inside: schema.graphql. Aaaaand… That’s it! You try try to Query the helloWorld query we created and it should be working! Running npm run build in your terminal will compile your code and put it in the /dist folder. You can run the compiled code with npm start. Here is the repo with all the code.